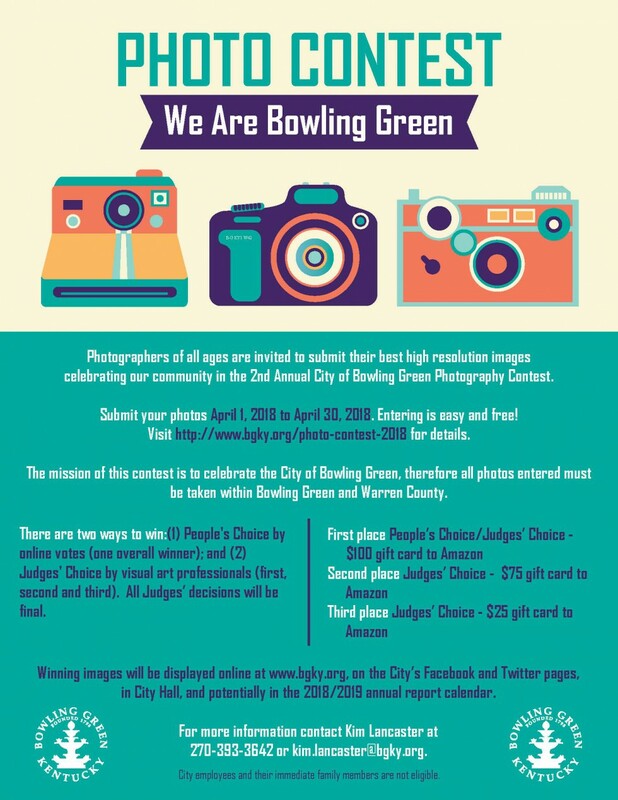 The City of Bowling Green is inviting photographers of all ages to submit their best high resolution images celebrating our community in the Second Annual City of Bowling Green Photography Contest – We are Bowling Green! Submission entries will be accepted April 1 – April 30th! Entering is free and easy. Visit http://www.bgky.org/photo-contest-2018 to view all rules, criteria, prizes and to upload your photo. Participants should select images that best depict Bowling Green’s beautiful environment, active people, and vibrant community life. This includes but is not limited to sky, parks, rivers, wildlife, cityscapes, landmarks, people participating in sports and arts, or special events, and other activities. First, second and third place winners will be chosen by a panel of Judges and a first place People’s Choice award will be chosen by online voting. First place winners will receive a $100 gift card to Amazon and second and third place will receive $75 and $25 respectively.